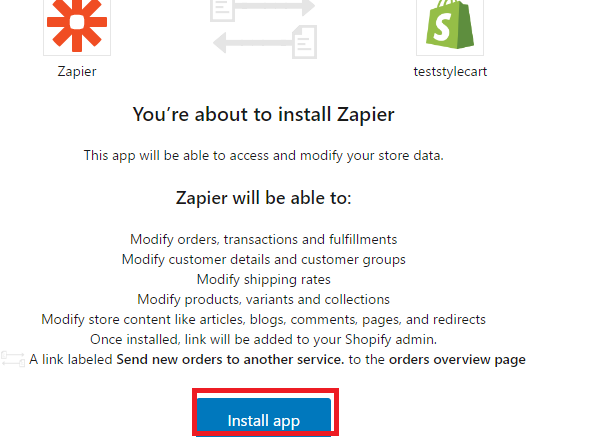 You can easily integrate Shopify with EasySendy Drip (or EasySendy Pro) via Zapier. Zapier will automatically add the new customer to your selected EasySendy Drip (or EasySendy Pro) subscribers list when you fill out the row. Here we have defined simple steps how to integrate Shopify with EasySendy Drip (or EasySendy Pro). 1. Register and Login to EasySendy Pro. 2. Register and Login to Zapier. 3. After login to Zapier, click on “Make a Zap” appearing at the top of a screen. 4. Now, choose a “Trigger App” such as Shopify,Google Contacts, Google Sheet, etc. 5. On Set up page choose “New Customer” and click “Save+Continue” tab. 6. Now on next page, you have to select the “New Account” from your “Shopify Account” and click “Test” tab then save and continue. 7. Go to your Shopify account, click on “Install App”. 8. Select contact group and click “Test” tab then save and continue. 9. On the next step choose the Action App, select “EasySendy Pro” from search option. 11. Now the integration of Shopify with EasySendy Drip (or EasySendy Pro) is completed and ready to use.